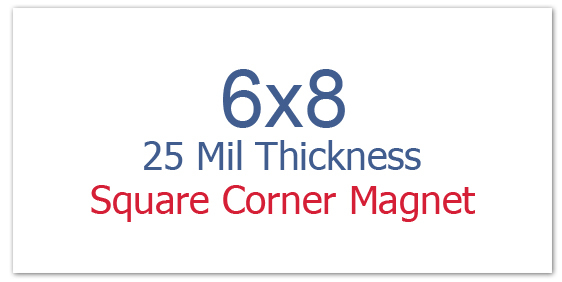 Custom 6x8 inch printed square corner full color magnets -25 mil are employed by marketers, who eye long term benefits from single time investment. Going by trends, most of the customers who ordered this magnet are from healthcare, food, fashion, & luxury related niches because their businesses often survive the competition. Also, people will be happier to retain a promotional 6x8 inch printed square corner full color magnet giving out details of such services because they are of regular use for them. A personalized 6x8 inch printed square corner full color magnet can be handed out during any typical marketing event as an introductory token or an encouragement token. It also makes a great choice for sending out mailers as people will retain it as a sign of great business relationship that they share with you. Product Size : 6 in. x 8 in.